← Printable Egg Holders with Free Codes! Head to the KinzStyle Outlet now to check out the new 2019 Spring Clothing Line! What do you think of this collection? Tell us your favorite in the comments below. 84 Responses to Spring Clothing Line NOW AVAILABLE! Does anyone know if you can buy the cute raincoat with the ducks in the ad? Thanks Rocky5465 for doing this to help out. 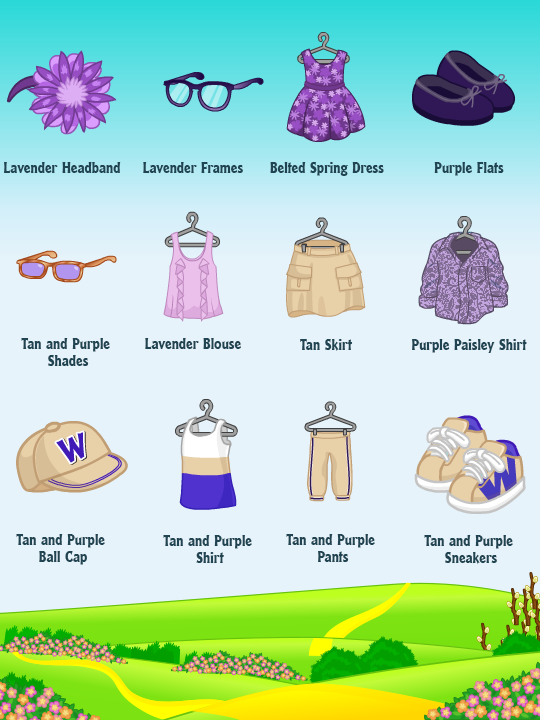 I would like the Lavender Headband, the Belted Spring Dress, the Purple Flats, and the Lavender Blouse. Thanks again for helping out us Non-Deluxe players. My user name is Cupcakeflowers. Heya, pinkzebra33330! It’s me, 09xStarlightx09! =) Thanks for all the stuff you have sent me! I’ll try to send those soon. Have a swagalicious and fantabulous day! Thanks and have a great day too. Ok I’ll be on a look out for it! My username is honeyleaf. and I would like the Belted Spring Dress, and Purple Flats. Okay I’ll send you a request! Thanks Rocky5465 for doing this to help out. I would like the Lavender Headband, the Belted Spring Dress, the Purple Flats, and the Lavender Blouse. Thanks again for doing this to help out us Non-Deluxe players. My user name is Cupcakeflowers. P.S. I already wrote this commit before but I put it in the wrong place. Oops. I sent you a friend request, so you do not have to send me one, you just have to respond to mine. Thanks! You can send me one if mine did not reach you, but the phone said that my request had been sent, so we should be good. Thanks again! No worries princesssebastion, I’ll send a request right now! I’m so sorry princesssebastian, It won’t let me send Kinzpost packages to Free Players, I can still send you the clothing if you decide to buy a pet, just send me any Kinzpost letter letting me know if you do, and I’ll send them!